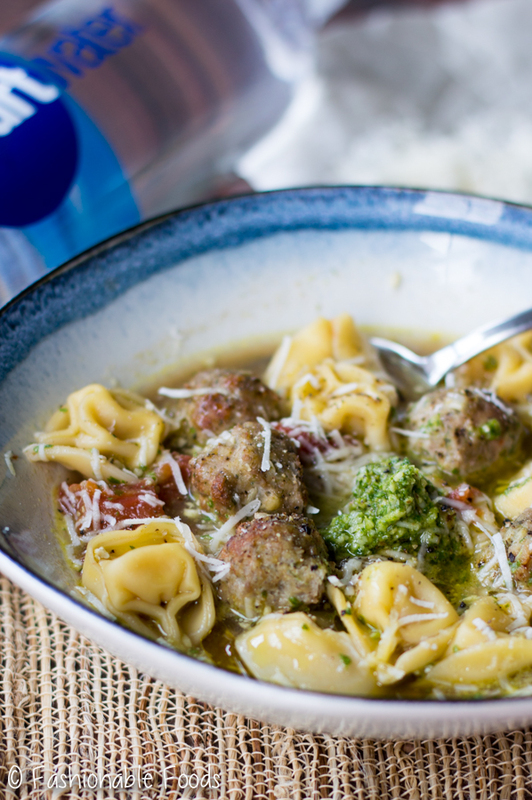 Fresh tortellini, homemade chicken meatballs, and a zesty arugula pesto combine to make one delicious soup. Tortellini and chicken meatball soup is the perfect combination of flavors, but is super easy to make! Hello friends! Today is an exciting post because not only do you get a delicious recipe, but you also have a chance to win a pretty awesome opportunity! I don’t know about you, but I’m always up for a fun (and easy-to-enter) sweepstakes. Now that you’ve entered for your chance to cook with award-winning chef and television personality Aarón Sánchez, you’ll probably want to get in the kitchen and make something delicious! Luckily I’ve got you covered there. If you’ve been following me for a while, you know how much I love soup. It’s a perfect make-ahead option for a quick dinner or easy lunch to pack for work. Plus, you can freeze any extra soup to enjoy whenever the craving strikes. 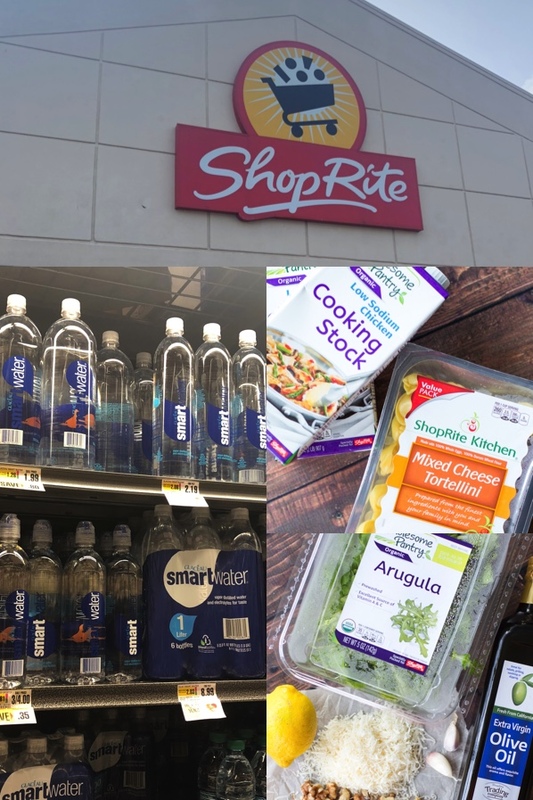 Now, you may be thinking by the title that we have a lot going on here, but I promise you with the help of ShopRite and a few easy steps, you’ll be shocked at how simple this recipe really is. 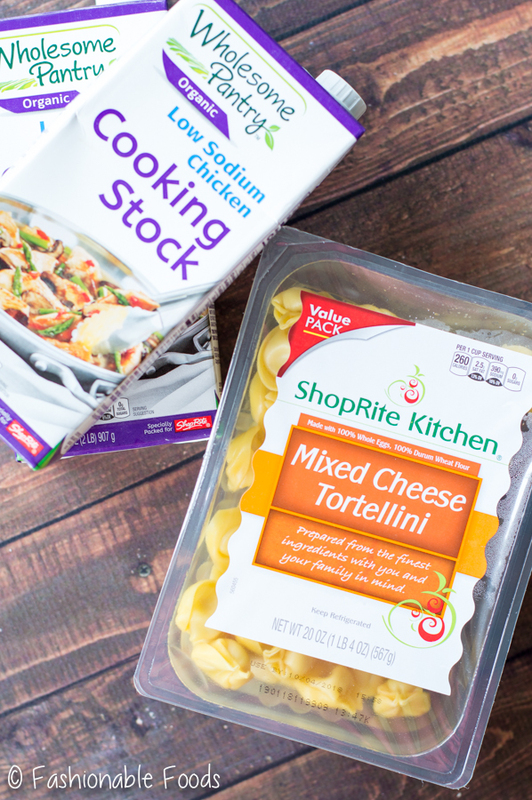 While shopping at ShopRite the other day I was able to grab all I need to make this tortellini and chicken meatball soup. In fact, this soup is inspired by ShopRite’s recipe for Walnut Arugula Pesto Linguine and Meatballs. 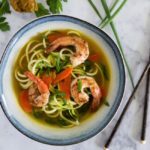 I decided to take their delicious pasta recipe and turn it into a soup perfect for heading into fall. With the help of great ShopRite and Wholesome Pantry ingredients like fresh arugula, olive oil, and fresh cheese tortellini you can whip up this soup in no time. 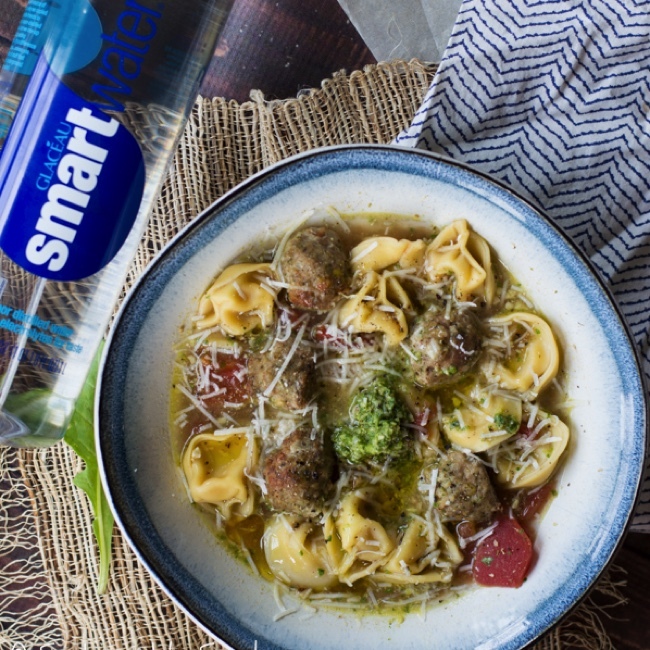 While I was shopping, I made sure to grab smartwater® for the perfect refreshing drink to accompany my soup. Ok, now that we have everything we need, we are ready jump in and get started on the recipe. First up we make the walnut arugula pesto. 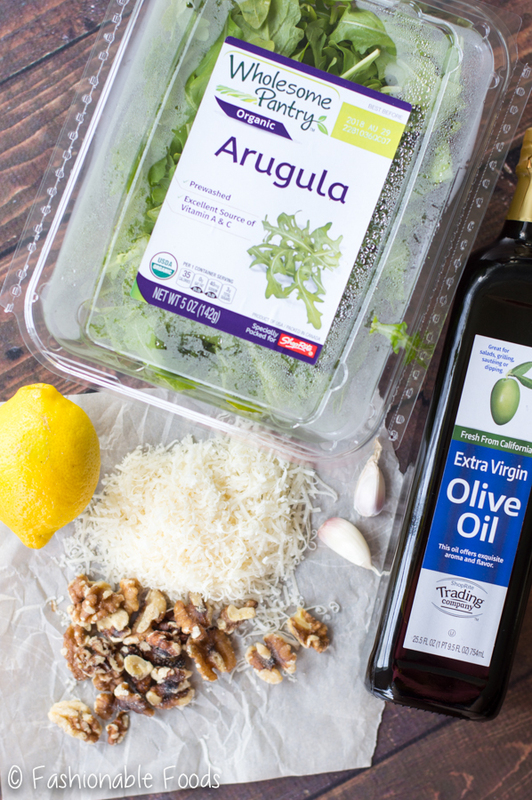 In your food processor, pulse together the arugula, walnuts, garlic, and lemon juice until finely chopped. Stream in the oil with the machine running and you’ll see the pesto come together quickly. Transfer it to a bowl and stir in the parmesan cheese. It’s important to make the pesto first because we are going to use it in both the meatballs and in the soup. 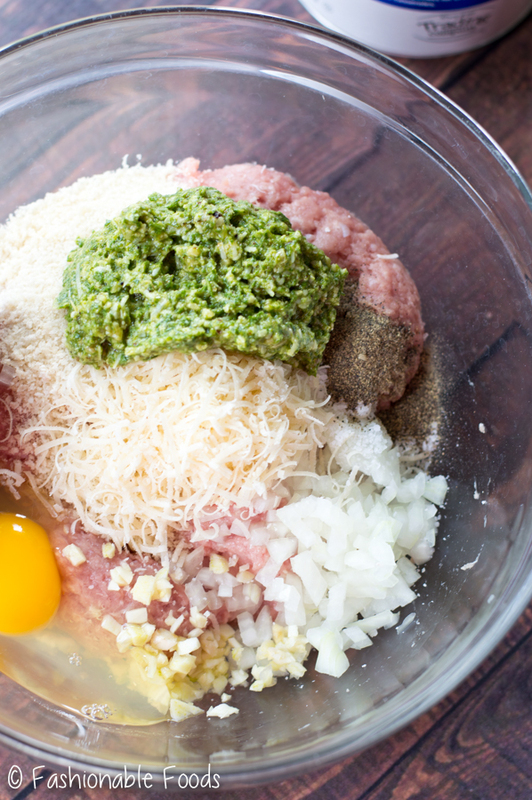 For the meatballs we’re using ground chicken, panko breadcrumbs, onion, garlic, more cheese, an egg, and 1/3 cup of the walnut arugula pesto. Mix it all up, form them into mini meatballs, and bake ’em at 400º for about 12 minutes. Very simple! While your meatballs are baking, bring 8 cups of chicken stock and 1 can of diced tomatoes to a boil. Pop in your fresh tortellini and cook for 3-5 minutes, or until they float to the top. Toss in the cooked meatballs and 2 spoonfuls of the walnut arugula pesto and give it a good stir. And just like that, you’re ready to eat! Serve the soup by ladling it into bowls and top with additional grated parmesan cheese, more pesto, and a drizzle of olive oil. 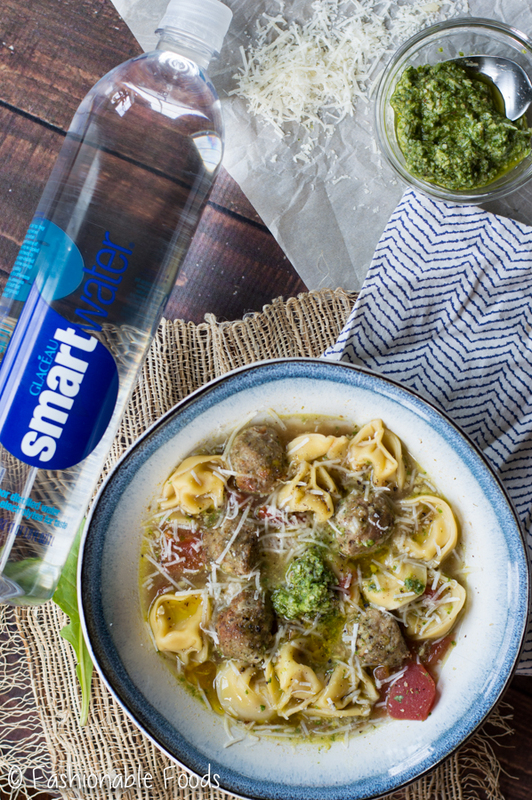 Don’t forget to have plenty of smartwater® to enjoy along with your soup! 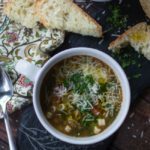 I can promise you this simple soup is full of flavor and will have you coming back for seconds. In fact, my husband had 2 big bowls and declared it his favorite soup! I agree, of course. ? 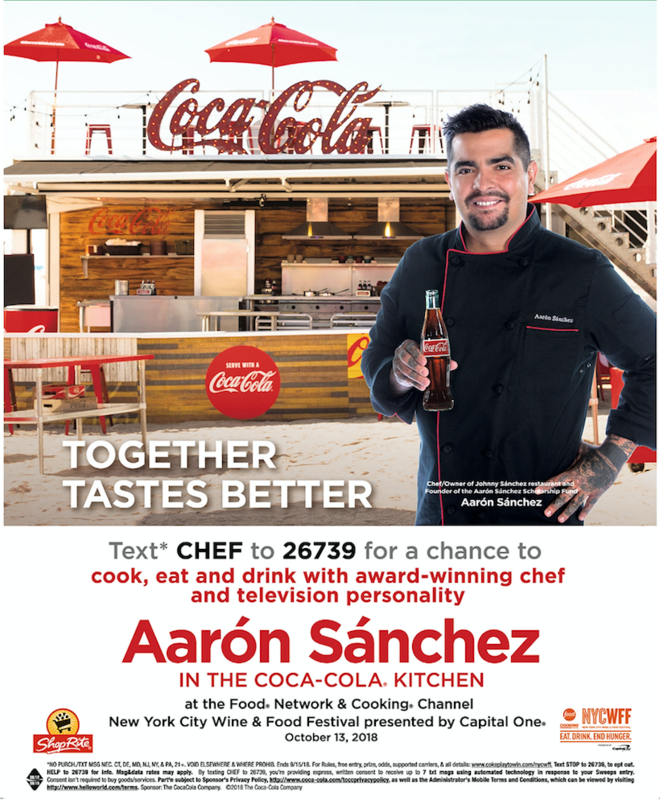 Make sure to enter for your chance to win the amazing opportunity to attend the New York City Wine & Food Festival and cook with award-winning chef and television personality Aarón Sánchez in the Coca-Cola Kitchen! You can enter here or by texting CHEF to 26739. Best of luck – I’ll be rooting for you. ? Combine the garlic, arugula, walnuts, and lemon juice into the bowl of a food processor and pulse until finely chopped, scraping down the sides of the bowl as necessary. With the food processor running, stream in the olive oil and you’ll see the pesto come together. Transfer the pesto to a small bowl and stir in the cheese. Set aside. In a medium bowl, combine the ground chicken, breadcrumbs, 1/3 cup of the pesto, onion, garlic, cheese, egg, salt and pepper. Mix until everything is well combined but being careful not to over mix. Using a small ice cream scoop, portion out the meatballs onto a baking sheet. Drizzle with olive oil and bake for about 12 minutes or until the meatballs are cooked through (160º). In a large soup pot, pour in the chicken stock and diced tomatoes. Bring the mixture to a boil. Add the tortellini and cook for 3-5 minutes or until the tortellini all float to the top. Add in the meatballs and give the soup a good stir. Season with salt and pepper, to taste and serve the soup topped with a spoonful of the pesto, grated cheese, and a drizzle of olive oil.